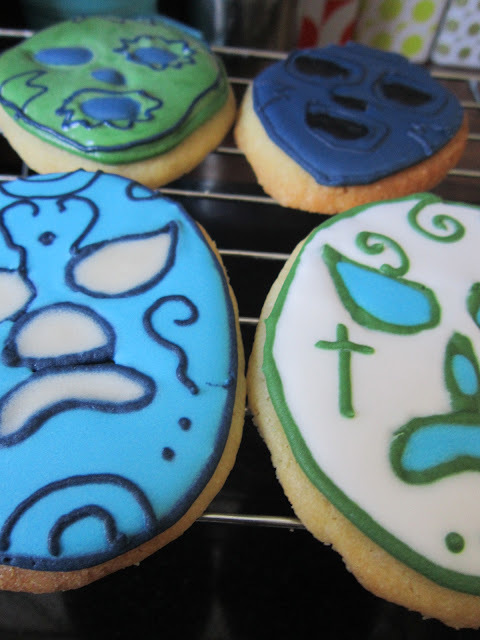 I brought this little offering to the States for one of my gorgeous brothers-in-law..He has been waiting months for me to ‘cookie him up’ and asked Mr Cookie if I could bring a couple for him to try so I tried my hand at Mexican wrestling masks. My own interpretation but it would be easy to find images of particular masks to copy directly. I was very pleased with the aqua and white mask but ‘schoolie’ really liked the dark blue as it was ‘smiling’.